Hollywood makes it seem like being trapped in a burning car is a regular occurrence, with even the most superficial auto accident leading to a roaring inferno. A recent police chase in South Los Angeles resulted in a car exploding while the suspect fled into the comparative safety of police custody. The car fire closed a major highway for nearly two hours. So car fires are a legitimate concern, and roughly 4 people per week in the US die in a car fire. However, the reasons why a car might emit smoke, and knowing which colors of smoke indicate imminent danger can help drivers make safer decisions, potentially saving lives. If the car you are driving is emitting smoke, the first issue is to determine the general source. Smoke from the exhaust is a concern; smoke from the engine compartment is a critical emergency. If you see smoke of any color coming from the engine bay of your vehicle, you should stop driving immediately, move far away from the vehicle, and contact emergency services as soon as possible. Exhaust smoke, while concerning, is less of an imminent danger, at least in regard to fires and explosions. It can, however, signal serious damage having been done or currently happening to the vehicle, possibly as a result of a lack of maintenance or a defective part. Knowing which colors of smoke are serious and which can wait while you drive to the mechanic’s garage can be very helpful. The following colors all refer to smoke coming from the exhaust of the vehicle, because any smoke emerging from the engine compartment is an emergency. White smoke: Thin white smoke coming from the exhaust pipe is most likely condensation, particularly if it dissipates quickly. Thick white smoke from the exhaust pipe that continues after the vehicle is completely warmed up is usually due to coolant being leaked into the engine. This can indicate a blown head gasket, damaged cylinder head, or cracked engine block, and lead to an overheated engine. This is a major vehicular red flag that can leave you stranded with a dead car, but will not lead to an auto fire or explosion. Blue smoke: Blue smoke, of any depth of color or shade, means your car’s engine is burning oil. A car can burn oil from an oil leak into the combustion chamber, a failed piston ring, or malfunctioning valve stem seal. You will likely also see a significant decrease in engine performance and power. Running a car with low oil, or none at all, can be fatal to the engine. Blue smoke is not a good sign for a car, but unlikely to lead to any explosion. Grey smoke: Grey smoke generally stems from transmission or oil problems, such as issues with transmission fluid or faulty transmission vacuum modulator. It can also be a result of issues with a turbocharger in vehicles so equipped. Another potential cause for grey smoke from the exhaust is a stuck positive crankcase ventilation system. While any of these complaints could lead to a trip to the auto shop, they should not be expected to generate a fire or explosion. Black smoke: Black smoke is perhaps the most visually alarming, but the color doesn’t always correlate with the severity of the associated problems: it is often a result of the engine burning too much fuel. The causative concerns can range from air filtration problems to sensor or injector failures. Black smoke, more rarely, may also come as a result of an electrical fire, in which case there would also be a strong electrical burning smell in addition. This type of fire is dangerous due to the noxious smoke produced more so than any risk of explosion. Whether a car fire resulted from improper maintenance, a car accident, or the failure of a defective part, the danger to other motorists is grave. 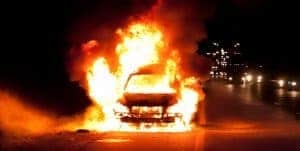 If you were injured by a car fire, place your faith in a law firm with a long history of supporting auto accident victims across Southern California. Call Taylor & Ring today at 310.776.6390 or complete our contact form to schedule a consultation with a knowledgeable Los Angeles car crash lawyer.